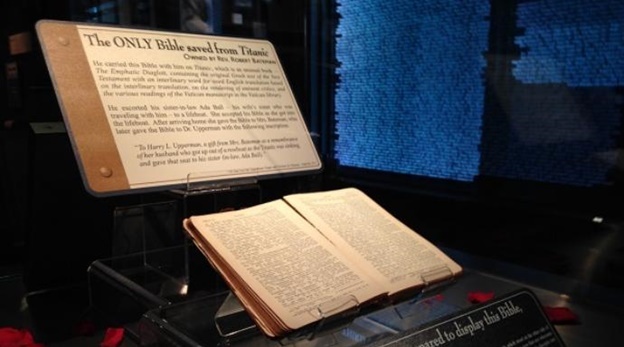 The 2016 World Exclusive Exhibit at the Titanic museum is a wonderful Branson attraction where you see the bible that survived from the sinking of the RMS Titanic during its maiden voyage. Best known as the Titanic Bible, this King James version bible belonged to Rev. Robert J. Bateman, who founded the People’s Tabernacle Church in Knoxville, TN. At the time of the sinking of the Titanic, Rev. Bateman handed the bible to his sister-in-law, Ada Ball before she boarded the lifeboat. On her safe return, Ball handed the bible to her sister, Emily, Bateman’s wife. Bateman was back in England in early 1912 and stayed for a couple of months. But then he booked a second class accommodation on the Titanic, thinking to return to Jacksonville to continue his work. Bateman must have felt some premonition that he might not reach New York. The postcard he mailed in Queenstown, Ireland where the ship docked, told his nephew: “Tom, if this ship goes to the bottom, I shall not be there, I shall be up yonder, Think of it!” His thoughts seemed to be unbelievable as the Titanic was widely known as unsinkable. The bible that you will see in the Titanic Museum belongs to the Upper Room Museum in Nashville, where it was on display. It was dedicated on National Day of Prayer on May 1, 2014 at the Pigeon Forge, TN. In the interactive Titanic Museum in Pigeon Forge, Bob Thone, the actor who portrayed Rev. Robert J. Bateman explained to the local TV station of how the bible ties into the East Tennessee community. This bible that survived the sinking of the infamous ship on April 15, 1912, will be on display in the Titanic Museum in Branson this 2016. Also on display at the Titanic Museum in Branson is the violin of Bandmaster Wallace Hartley that he played at the time of the sinking of the RMS Titanic. The violin is a gift from his fiancé, which features a plaque affixed to this priceless instrument. The museum also features an interactive display of the grand piano along reproduced images of musicians who were aboard on the ill-fated Titanic. Visiting pianists can have the opportunity to play a tune or two. The Titanic Museum is a fascinating Branson attraction that hosts special events throughout the year, so you always have the chance to visit the museum.